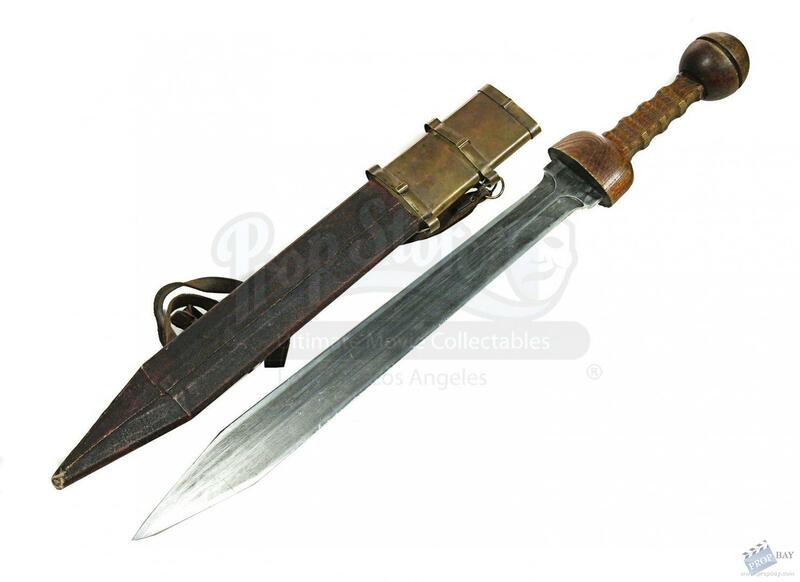 A metal arena sword and scabbard used in the Ridley Scott multi-Oscar winning movie Gladiator. This particular style of sword has a distinctively shaped 'gladius' blade indicates it was used during the arena fighting sequences such as the Battle of Carthage where Maximus (Russell Crowe) and his fellow gladiators are forced to fight for their life. This long sword is made from metal with the blade painted on each side to appear worn and small nicks along the edges which curves towards the handle. The handle has been beautifully crafted out of wood with the cover being made of synthetic material that has a leather appearance with gold coloured metal. Attached to this is a faux leather brown strap.This exquisite piece remains in a really good production used condition and measures approximately 79cm x 10cm (31” x 4”). COA is from Prop Store London. Added: 04-02-2013 - Viewed: 2337 times.